Some people took out an Mystical Space Typhoon or 2 to put this card in their deck. I have one question for them... Why? I'm simply going to compare this card with MST. 1st of all, Bait Doll is way too situational for my taste. Since Jinzo was released, most people do not play with a lot of Trap Cards anyway. MST is a lot more versatile as it can destroy both face up/face down Magic AND Trap cards. MST is also a Quickplay and is probably one of the best ways to get rid of Imperial Order (if you Chain to the activation of Imperial Order, of course). The only good point to Bait Doll is that it's reusable (kinda). I would give it a lot higher rating IF Bait Doll simply returns to your hand. Shuffling it back to the deck makes your deck thicker by one card, which isn't such a good idea in most cases. Having to draw the same card over and over again is not fun. Which is why I don't like cards like Sword of the Deep Seated and Horn of the Unicorn. 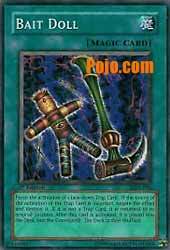 Sword of the Deep Seated is a pretty good Sidedeck card against Deck Destruction though. This card forces a trap card to activate. If the timing is incorrect, then the card is destroyed. This is a very good alternative to MST. A very good way to get rid of Mirror Force or Torrential Tribute. In addition, this card also returns to your deck. just released as a common in the Pegasus deck, there isn't really a reason you should use this card over MST. I give it 3/5. I personally would just stick with the MST as it can destroy magic cards as well. Effect: Force the activation of 1 face down Trap Card. If the timing of the activation of the Trap Card is incorrect, negate the effect and destroy it. If it is not a Trap Card, it is returned to its original position. After this card is activated, it is placed into the Deck (not the Graveyard). The Deck is then shuffled. Though the card is very situational, it works out pretty well. It stops some of the biggest Trap cards we fear, dead in their tracks. Examples would be Mirror Force, Magic Cylinder, and Torrential Tribute. Not to mention it hurts Counter Trap cards as well. That isn't the main reason why it's a decent card though. Because we all know Mystical Space Typhoon does all that, plus more. The fact that Bait Doll gets shuffled back into your deck after use, is what makes it an interesting card. This allows it to work well as a single copy in your deck (I wouldn't reccomend playing anymore). Bait Doll does have many flaws though. The main one being that it bites to Continuos. And with Skull Lair soon going to be gaining alot of popularity (I guarantee it), it doesn't make it any better at all. Strictly an average card, but one that's worth playing in single-copy form.